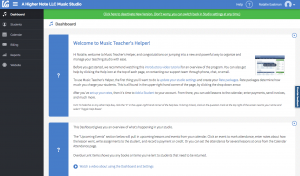 At A Higher Note LLC, we’re busy getting all students’ (and parents/guardians/payors, where applicable) information ]inputted into an online studio administration system called “Music Teacher‘s Helper” (MTH). I believe that this system will serve all involved with A Higher Note LLC studio in many ways, with many improvements! Whether you’re a new or existing student (or you are a parent of a student), you should have received at least one notification/reminder regarding upcoming lessons and, hopefully, a “welcome” email asking you to log into their system and complete your profile. While you are in there, please take a few minutes to watch the video overview and any other of their (thankfully) brief instructional videos you have time to watch at the moment. 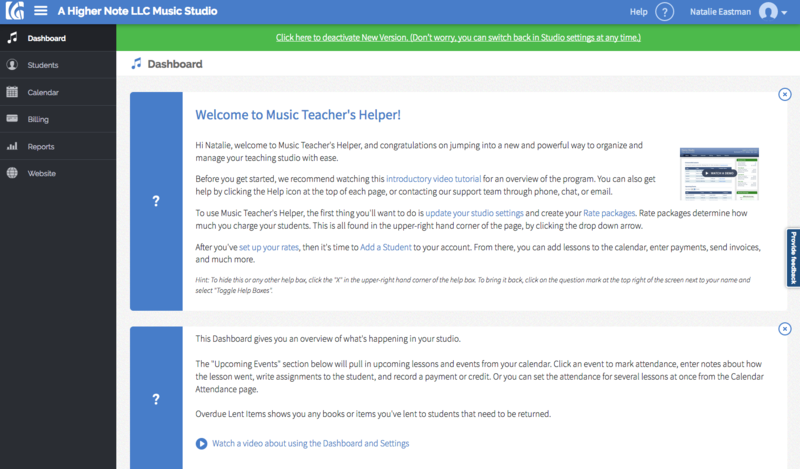 MTH does a lot of very helpful stuff for both studio owners and teachers, as well as for students (and their parents, where applicable). a central A Higher Note LLC calendar with your lessons (all regular ones and any rescheduled or canceled ones) plus my vacations, which will be marked as “blocked days” on the calendar. a messaging method enabling either/both student or parent to communicate with me directly, easily, and quickly. MTH notifies students (and/or their families) of the upcoming lessons and any other events on the calendar that I specify. It also does payment reminders. You can even make payment through it (via PayPal). Don’t worry, you can always still pay by check or cash in person, no problem. I have the ability to easily input whatever payments you make in person. Just wanted to let you know this (very good) change is coming and request that you get onboarded asap! Look for these above-mentioned emails from Music Teacher‘s Helper in both your inbox and in your spam folder. Watch the introductory overview video and any other videos you’re able to watch in the other areas. Be sure to Contact us if you encounter any problems with MTH. You can use our online contact form here or the MTH messaging system.